Here is a Chinese tablet worthy of your consideration. Running Android Jelly Bean, with 10" display, priced at $210. The Ainol online store listed the tablet as "Out Of Stock". 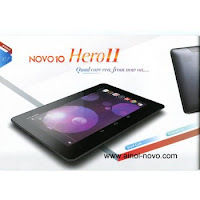 So how about this Ainol Nova 10 Hero II tablet? For $209 dollars you’ll get an IPS display, quad-core power, and Android 4.1 Jelly Bean. Pretty good deal if you ask us. Obviously the question remains on build quality and that processor. Unlike some Chinese tablets, this indeed comes with the Google Play Store for full access to the 700,000 Android apps available today. The tablet isn’t quite available yet, but can soon be yours for $209 if you feel like making the jump and giving it a try. What about the specs ? Today the company revealed its latest product – Novo 10 Hero II a 10.1 (1280 x 800) tablet which runs the latest Google Android 4.1 Jelly Bean operating system with the help of a ACT ATM7029 quad-core processor. Ainol Novo 10 Hero II also comes with 1GB of RAM, 16GB internal memory expandable for up to 32GB via a microSD card slot, dual-cameras (2MP on the back, 0.3 VGA in front), support for external 3G dongle, WiFi, Bluetooth, GPS, plays 1080p videos and a 8000 mAh battery. This tablet is worth checking out.